A University of Illinois and Mayo collaboration has demonstrated a novel gene expression analysis technique that can accurately measure levels of RNA quickly and directly from a cancerous tissue sample while preserving the spatial information across the tissue —something that conventional methods cannot do. The team's gene expression technique is described in a paper published today in the online edition of Nature Communications. According to Illinois Bioengineering Professor Rashid Bashir, existing gene expression methods have limitations. 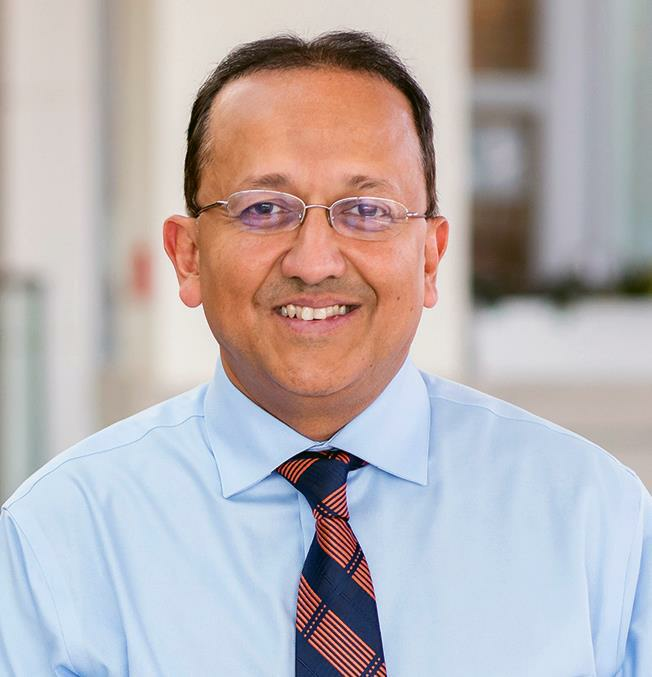 "They are cumbersome and slow, taking hours or even many days to do the analysis across just one tissue sample," said Bashir, co-leader of the research team, who is a Grainger Distinguished Professor of Bioengineering and the Carle Illinois College of Medicine executive associate dean. "Our technique does the entire analysis across the tissue slice in two hours or less." Existing methods can measure proteins, which are produced after genetic information or instructions have flowed from DNA and RNA. Those protein-measuring methods are complicated and require antibodies that don't exist for certain proteins. "Our method can detect messenger RNA expression, which can provide additional insight than just the final protein concentration," said Bashir. The pixelated spatial gene expression tool can analyze an entire tissue sample and identify cancer cells in a process that takes less than two hours. Research team co-lead Dr. Farhad Kosari, an assistant professor of biochemistry and molecular biology at Mayo Clinic, envisions their new technique could someday be used in research labs as well as the clinic. "If you were studying tumor microenvironments, you'd want to know what genes are expressed at a specific location of the tumor," said Kosari. "This ability to look at localized expression of genes is currently done with fluorescence in situ hybridization (FISH), but our technique is a lot faster and more quantitative." In addition, the messenger RNA (mRNA) will elicit more accurate genetic information. "When analyzing animal models and xenografts, there can be cross reactivity of the target antibody with the host antigen leading to false positive signals and error in analysis," said Illinois Bioengineering doctoral student Anurup Ganguli, the first author of the study. The team created a fingernail-size silicon chip that contains an array of more than 5,000 pyramid-shaped wells with razor-sharp edges. When a centimeter-sized cancer tissue sample is placed on the chip it is automatically cut up into hundreds or thousands of tiny pieces that are analyzed in parallel using an existing technology known as loop mediated isothermal amplification (LAMP). According to Ganguli, once the tissue is cut and placed into the underlying wells on the microchip, thousands of independent picoliter volume LAMP reactions are performed in each well directly from the tissue without the need for any analyte purification. Ganguli demonstrated the new technique using frozen human prostate tissue xenografts grown in mice. In less than two hours, he was able to amplify and analyze the mRNA of TOP2A, a nuclear enzyme and known marker of prostate cancer's aggressiveness. "Our approach pixelates the entire tissue sample and can identify those very few cells that may be cancerous," said Bashir. "There isn't any technique in existence that takes raw tissue to nucleic acid amplification while keeping the spatial information preserved." The new technique may also be useful someday for helping physicians and pathologists determine tumor margins, which could enhance the outcome of cancer surgeries. The team continues to work on the gene expression technique and aims to use it to map genetic mutations for lung and breast cancers, in addition to prostate cancer. 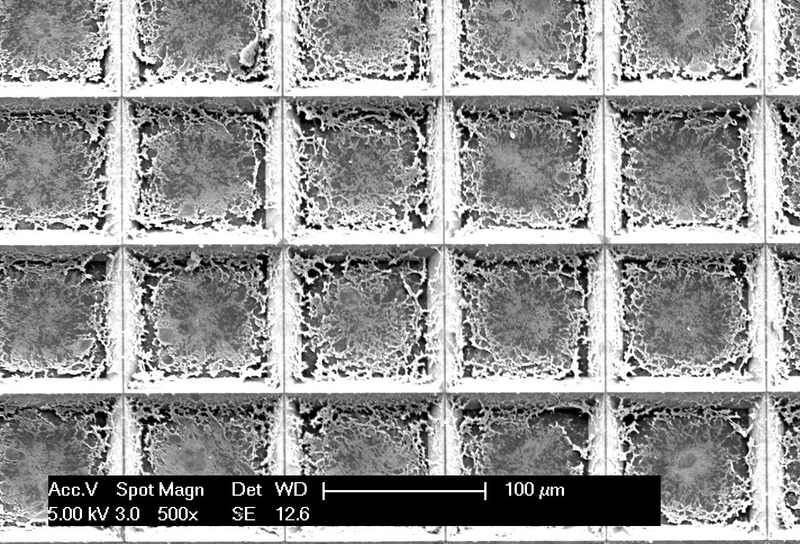 They are also working to reduce the size of the wells on the chip below the current 100 x 100 microns. This modification will result in being able to examine individual cells at higher resolution. Other members of the research team include: Bioengineering faculty Rohit Bhargava, Wawrzyniec Dobrucki, and Andrew Smith; Bioengineering doctoral students Akid Ornob, Gregory Damhorst, Christian Konopka, and Tanmay Ghonge; Briana Thornton, an undergraduate summer research student; post-doctoral research associate Nicolas Spegazzini; and Professor Susan Clare from the Feinberg School of Medicine at Northwestern University. The work was funded by multiple sources including a seed grant from Qualcomm, a grant from from NIH through CIMIT (Boston), NSF, the UIC Cancer center Pilot grant, and additional grants from NIH. The work was facilitated by the Mayo-Illinois Alliance for Technology Based Healthcare. The complete title of the research paper is: "Pixelated spatial gene expression analysis from tissue."